The beat goes on: First-time jobless claims rise again…Four-hundred and twenty-nine thousand people put in initial unemployment claims, the Labor Department said. That’s an increase of Â 9000 over last week’s revised figure of 420,000. 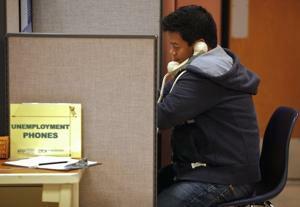 The number of Americans filing first-time claims for jobless benefits, already high, rose again last week. Four-hundred and twenty-nine thousand people put in initial unemployment claims, the Labor Department said. That’s an increase of Â 9000 over last week’s revised figure of 420,000. The four-week moving average, which is designed to smooth out volatility in the data, was unchanged from last week, at 426,250. As we wait for June’s employment figures to be released next week, there’s little good news on the jobs front. Unemployment is at 9.1 percent, and employers created a paltry 54,000 jobs in May. The Federal Reserve yesterday lowered its projections for growth this year and next. It also raised its projections for unemployment. Some people have advocated legalising dog eating so that the farming and slaughtering could be regulated. A little thought shows this to be a very wrong idea. exists. Unlike other domestic animals raised for food, dogs are carnivores. raising and slaughtering dogs and that, in their opinion, it cannot be done. is the precedent to follow. SEOUL (Reuters Life!) – Thursday was not a good day to be a dog in South Korea. That’s because it was one of the three hottest days according to the Korean lunar calendar — and dog soup is one way to beat the heat. On "Chobok," people seeking to protect the body from overheating eat traditional healthy foods such as ginseng chicken soup, broiled eel, and "bo-shin-tang," literally "body preservation stew." Dogs are bred to be eaten in South Korea, and advocates say bo-shin-tang, which consists of dog meat boiled in a mix of hot and strong spices and vegetables, is good for the health. It is considered a delicacy by some. "The reason why I eat dog soup is because it boosts my energy, even when I’m most tired," said 56-year-old Shin Gwan-sup, sitting in a dog soup restaurant. "Compared to other meats, it has more protein and less fat. I think it is healthy and clean, a more suitable meat for us." The Korean practice of eating dog has drawn criticism from overseas for its cruelty, with French actress and animal rights activist Brigitte Bardot among some of the most vocal critics. But Korean dog meat connoisseurs remain undaunted, with long lines forming on Thursday outside dog specialty restaurants. Beating the heat was painful for diners this year, though, with the price of the ginseng chicken soup, or sangyetang, jumping. Severe rain has also pushed up the price of vegetables used in the soups. Is it healthy for school kids to dwell on a death? Question by Troy: Is it healthy for school kids to dwell on a death? I have observed my 8th grade daughter’s msn logs and found that many kids at her school and the high school are excessively making comments about how they miss a girl who has passed away. She was a junior and many of these kids hardly knew the girl, yet they post messages, draw pictures in art class or doodles, wear t-shirts and display window stickers, etc. in memory of the deceased girl. It has become sort of a popularity thing that I don’t think is healthy. It’s been almost a year since she passed. Last night I overheard 2 high school girls talking and one of them stated that “tomorrow is” (the deceased girl’s) “birthday”. She repeated herself to make sure that the other girl heard what she said even though there was no indication that she didn’t hear it the first time. It seems as though some kids are actually competing to be more grieving than others about the girl. Am I being insensitive or is this unhealthy?